Background: About half a century ago, Crandall classified the pathology of cervical myelopathy into five types. Several further classification systems were subsequently proposed. However, many patients do not fit into any of the types described in these classification systems. Methods: This study included 315 consecutive patients who were diagnosed with cervical myelopathy, underwent surgical treatment, and were followed up for at least two years. In each case, the motor and sensory functions of each extremity were evaluated utilizing the Grip and Release Test (GRT), the Triangle Step Test (TST), and the sensory score. Then, spinal cord cross-sections were assessed for damage, and the cases were classified into the following five types: Type I (anterior lesion), which involved dysfunction of a unilateral upper extremity; Type II (central lesion), which involved dysfunction of the bilateral upper extremities; Type III (posterior lesion), which involved lower extremity dysfunction with deep sensory disturbance; Type IV (hemilateral lesion), which involved unilateral palsy; and Type V (transverse lesion), which involved the spreading of neurological symptoms to all extremities. Comparisons of pre- and postoperative neurological status were performed among the five types. Findings: All but two patients were successfully classified into the five types. The mean age at surgery was higher in Types III and V. As for the preoperative severity of myelopathy, the patients’ motor and sensory function scores decreased from Type I to Type V. Types I (67.0%) and II (65.6%) demonstrated significantly greater postoperative neurological improvement than Types III (42.5%) and V (50.8%), according to the Japanese Orthopaedic Association score recovery rate. Conclusion: Based on our classification system, Types I and II of cervical myelopathy, in which the cord damage was mainly located in the grey matter, exhibited greater postoperative neurological improvement than other types involving long tract symptoms. About half a century ago, Crandall classified the pathology of cervical myelopathy into five types , and his classification system has been widely accepted worldwide [2,3]. This system helped physicians and surgeons to understand the various symptoms caused by cervical myelopathy and to recognize the pathophysiology of each patient. Later, Hattori reported that myelopathy advanced from type 1, in which damage was limited to the central part of the spinal cord, to type 2, which involves the pyramidal tract, and finally to type 3, in which the damage spreads transversely in the spinal cord . These classification systems have helped clinicians to diagnose cervical myelopathy correctly and to consider the optimal timing for surgical treatment. However, many patients do not fit any of the types described in Crandall’s classification or exhibit symptom changes that disagree with Hattori’s theory (Figure 1). Figure 1 Unclassifiable case by conventional classification systems. 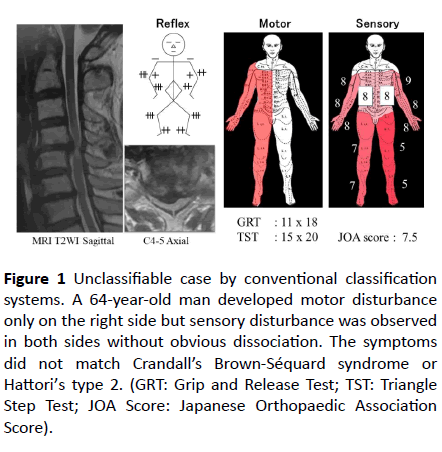 A 64-year-old man developed motor disturbance only on the right side but sensory disturbance was observed in both sides without obvious dissociation. The symptoms did not match Crandall’s Brown-Séquard syndrome or Hattori’s type 2. (GRT: Grip and Release Test; TST: Triangle Step Test; JOA Score: Japanese Orthopaedic Association Score). The aims of this study were to introduce this new classification system, which is considered to cover more patients with cervical compression myelopathy, and to clarify the neurological characteristics and postoperative neurological improvements seen in each type of cervical myelopathy. This study included 315 consecutive patients (212 males, 103 females) who were diagnosed with cervical myelopathy, underwent surgical treatment (anterior decompression and fusion (ADF) in 172 patients and laminoplasty (LAP) in 143 patients) at our hospital from 2003 to 2014, and were followed up for at least two years. Their mean age at surgery was 62.9 (range: 32 to 88) years. The adopted diagnosis was cervical spondylotic myelopathy in 218 patients and cervical ossification of the posterior longitudinal ligament in 97 patients. Patients with tumors, acute trauma, rheumatoid arthritis, cerebral palsy, or infectious diseases were excluded. All patients had the motor function of their four extremities objectively evaluated with performance tests and Daniels’ manual muscle test (MMT). The performance tests used were the Grip and Release Test (GRT) for the upper extremities  and the Triangle Step Test (TST) for the lower extremities . In addition, the sensory function of six parts of the body (the four extremities and the right and left trunk) was examined separately using the pinprick test and the tuning fork vibration test (maximum score: 10 points). Then, the lowest scores for each part were added up (maximum total score: 60 points) and recorded as the sensory score. Based on these quantitative scores, we decided which parts of the body had been affected in each case. However, the sensory score was subjective and was affected by the patient’s condition, the examiner’s manner, and other factors. As previous studies demonstrated that the abovementioned performance tests produced consistent scores, regardless of the timing of the test or the examiner [6-8], we considered that the performance scores were more objective and reliable ways of assessing the condition of the spinal cord. Therefore, our classification was mainly based on motor disturbance patterns evaluated using the performance tests and the MMT results for the four extremities. The motor disturbance patterns were classified into 5 types according to the affected extremities as follows: Type I (anterior lesion syndrome) involved dysfunction of a unilateral upper extremity, excluding cervical radiculopathy. Type II (central lesion syndrome) involved motor dysfunction (with/ without sensory disturbance), mainly in the bilateral upper extremities. Type III (posterior lesion syndrome) involved an ataxic gait and poor coordination of the lower extremities. Elderly patients are likely to complain of gait disturbance and loss of balance, but patients with this type of myelopathy usually exhibit obvious deterioration of deep sensation in the lower extremities. Type IV (hemilateral lesion syndrome) was characterized by hemi-palsy of the upper and lower extremities. As this type of cervical myelopathy demonstrated various sensory disturbance patterns besides typical Brown- Séquard syndrome combined with dissociation of superficial and deep sensation, we defined this syndrome as hemilateral motor dysfunction. Type V (transverse lesion syndrome) involved motor and sensory disturbance of all extremities. The optimal surgical procedure was determined according to the above-mentioned type of myelopathy and imaging findings from preoperative magnetic resonance imaging (MRI) and computed tomography (CT) myelograms by mutual agreement of the authors. The Japanese Orthopaedic Association (JOA) score was used to evaluate the patients’ pre- and postoperative neurological statuses . The recovery rate of the JOA score, which was calculated via the Hirabayashi method , was used to assess the postoperative neurological improvement in each case. In addition, the improvement rates of the other scores were calculated as follows: the standard score was defined as 25 times for the GRT score and the TST score, and 60 points for the quantitative sensory score at the final follow-up. When the preoperative GRT or TST score was ≥25 times, the data were excluded from the analysis. For the statistical analysis, one-way analysis of variance was used to compare the data for each type of cervical myelopathy. When the analysis of variance revealed significant differences among the five types, a post-hoc t test (Duncan’s multiple range test) was performed to analyze the significance of differences. Differences were considered to be significant at a probability level of 95% (P<0.05). All statistical analyses were conducted with a commercially available software program (SAS Institute, Inc., Cary, NC). All of the patients were classified into the five types, except for two patients that exhibited atypical motor disturbance (Table 1). Anterior lesion syndrome (Type I), which involved unilateral upper extremity disturbance, was found in 13.1% of patients. Type II (central lesion syndrome), which involved bilateral upper extremity disturbance, was found in 8.6% of patients. Posterior lesion syndrome (Type III), which involved bilateral lower extremity dysfunction, typically in combination with an ataxic gait, was seen in 5.4% of patients. Table 1 Novel classification of cervical myelopathy with prevalence of each type. Hemilateral lesion syndrome (Type IV) was characterized by hemilateral motor disturbance, with or without dissociated sensory disturbance. It included both typical and atypical Brown-Séquard syndrome. The prevalence of this type was 12.1%. The most common type of cervical myelopathy was transverse lesion syndrome (Type V), which accounted for 60.7% of our myelopathy patients. There were twice as many male patients as female patients; however, anterior lesion syndrome affected a significantly higher proportion of male patients than the other four types of cervical myelopathy. The patients’ mean age at surgery was 62.9 years old. The patients with transverse lesion syndrome had the highest mean age (65.8 years), followed by those with posterior lesion syndrome (64.7 years). There were no significant age differences among the five types of cervical myelopathy, but Types V and III demonstrated higher frequencies of patients aged >70 years. On the contrary, the patients with anterior or central lesion syndrome, in which the neurological deterioration was limited to the upper extremities, tended to be younger at the time of surgery (Table 2). Table 2: Demographics of each type. The neurological scores of the patients with each type of cervical myelopathy are shown in Table 3. Regarding the performance scores (the GRT and TST scores) of each group, the patients with anterior or central lesion syndrome exhibited GRT scores of <20, but their TST scores remained at normal levels. On the contrary, the patients with posterior lesion syndrome maintained GRT scores of >20, but their TST scores fell to <20. The patients with hemilateral or transverse lesion syndrome both demonstrated significantly lower performance scores because these scores are based on the lowest count for the right and left sides. Among the patients with hemilateral lesion syndrome, the mean degree of laterality was 8.0 times according to the GRT score and 4.3 steps according to the TST score. Table 3: Neurological scores of each type. As for the sensory score, which was calculated as the total of the scores for six parts of the body, the mean sensory score decreased as the extent to which the extremities were affected increased; i.e., it was highest in the anterior lesion syndrome group and lowest in the transverse lesion syndrome group. Similarly, the JOA score was highest in the anterior and central lesion syndrome groups and lowest in the transverse lesion syndrome group; i.e., the mean JOA score decreased from types I to V.
Postoperative neurological status was evaluated at two years after surgery using the abovementioned scoring systems. Then, the rate of improvement in each score was calculated by setting the maximum score at 25 times for the GRT and TST scores, 60 points for the sensory score, and 17 points for the JOA score. The GRT score, which represented upper extremity motor function, and the TST score, which represented lower extremity motor function, indicated that the degree of recovery was greatest in the central lesion syndrome group and smallest in the posterior lesion syndrome group. The rate of improvement in the sensory score did not differ significantly among the five types of cervical myelopathy. The JOA score, which is considered to be a tool for comprehensively evaluating spinal cord integrity, indicated that the Type I and II groups recovered to a greater extent than the Type III and IV groups (Table 4). Table 4 Post-operative neurological improvement. As for the differences in the neurological improvements seen after each surgical method, the mean JOA score recovery rate was significantly higher after ADF (60.8 ± 24.2%) than after LAP (46.3 ± 22.7%). ADF resulted in greater neurological improvements than LAP in all types of cervical myelopathy, except for hemilateral lesion syndrome, as shown in Figure 2. Figure 2 Comparison of neurological improvement by surgical method. Mean values of JOA score recovery rate with standard errors. Each asterisk (*) represents a statistical difference between Anterior Decompression and Fusion (ADF) and Laminoplasty (LAP) at p<0.05. The differences between the effects of ADF and LAP were statistically significant in the central and transverse lesion syndrome groups. The scores for the anterior lesion syndrome group were not comparable because LAP was only selected in two cases. The first complete delineation of the neurological syndromes associated with cervical spondylosis was performed by Brain et al. in 1952 . Later, Crandall and Batzdorf grouped cases of cervical myelopathy into 5 categories based on their neurological findings and the predominant form of spinal cord syndrome . This classification system, which was based on symptomatology, was quite rational in that it examines the neural pathways in cross-sections of the spinal cord; however, the five categories described by Crandall and Batzdorf did not cover all the patterns of cord damage found in compressive myelopathy patients. In fact, when we classified our patients according to Crandall’s system, 16% did not correspond to any of the five types. Since then, several other classification systems have been suggested, but most of them focused on grading the severity of cervical myelopathy in terms of the patient’s daily activity instead of the pathophysiology of their myelopathy [12-14]. Thus, we proposed a new simple and comprehensive classification system for cervical myelopathy, which is based on the presumed extent of neural damage in the spinal cord. As our classification is based on the patient’s neural symptoms, there were occasions when it was unclear which type a patient belonged to, particularly when the patient complained of incompatible sensory disturbance. We mainly classified such patients according to their motor dysfunction, which is more consistent than sensory disturbance. All but two of our patients were successfully classified into one of the five types, as shown in Table 1. However, we should be aware of the following points when diagnosing each type of cervical myelopathy. Anterior lesion syndrome is presumably caused by damage to the anterior horn and/or anterior rootlet, but this type of cervical myelopathy might also result from combined radiculopathy because the majority of patients in this group exhibited eccentric disk bulging, with/without osteophyte formation, not only in the spinal canal but also in the nerve root foramen. It was necessary to carefully exclude patients with pure radiculopathy or peripheral nerve entrapment syndrome based on physical examinations and imaging findings, but a substantial number of patients who had two or more symptomatic neural compression lesions remained. Such patients should be treated as if they have cervical myelopathy if they exhibit neurological damage that has been caused by lesions in the spinal canal. Central lesion syndrome is characterized by motor dysfunction (with/without sensory disturbance), predominantly of the bilateral upper extremities. In this group, the neural damage was localized in the central part of the spinal cord and involved the grey matter. When the damage reaches the corticospinal tract, the patient might display hyperreflexia in the lower extremities. Patients are classified into this type when no obvious neurological damage is seen in the lower extremities (as determined using the TST and JOA scores). However, this type of cervical myelopathy might progress to transverse lesion syndrome if the neural damage spreads to the entire corticospinal tract. Posterior lesion syndrome exhibits motor dysfunction, mainly of the lower extremities, without any obvious disability of the upper extremities. Patients with this type of cervical myelopathy demonstrate ataxic gaits, rather than spastic gaits, and usually display deep sensory disturbances in both legs. When patients mainly demonstrate neurological deterioration in the bilateral lower extremities and a cord compression lesion at the C6-C7 or C7-T1 level, it is difficult to differentiate posterior lesion syndrome from transverse lesion syndrome. In order to diagnose posterior lesion syndrome in such cases, tests of deep sensation and equilibration function need to be performed. Hemilateral lesion syndrome typically involves so-called Brown-Séquard syndrome, which is characterized by the presence of a hemilateral cord lesion combined with an ipsilateral corticospinal deficit and contralateral hypoalgesia below the level of the lesion. However, we encountered many patients with unilateral motor disturbances in the upper and lower extremities with sensory disturbance on the same side, or on both sides. We defined this type of cervical myelopathy as hemilateral motor disturbance, regardless of the pattern of sensory disturbance. It appears likely that this syndrome is a less advanced form of the disease and might progress to transverse lesion syndrome. Transverse lesion syndrome is considered to be the most advanced type of cervical myelopathy. It involves the corticospinal, spinothalamic, and other tracts as well as the grey matter in the spinal cord. It causes the typical neurological symptoms of cervical myelopathy and was the most frequently encountered type of cervical myelopathy among the patients who underwent surgical treatment at our institution. In general, the patients with anterior or central lesion syndrome, in which the damage was limited to the grey matter, exhibited greater neurological improvements after surgical treatment. However, once the pathological changes extended into the white matter, which includes the ascending and descending tracts, surgical decompression did not result in marked recovery of neural function. Patients with hemilateral lesion syndrome might be more likely to recover from such tract damage because they seemed to suffer shorter periods of illness than patients with posterior or transverse lesion syndrome. As this type of cervical myelopathy causes tract signs without segmental signs, poor blood supply from both the anterior and posterior spinal arteries due to the encroachment of the spinal canal within a relatively short period of time might contribute to the rapid advancement of symptoms in such cases [15,16]. This must be one of the main reasons why only this type of cervical myelopathy exhibited marked neurological improvement after laminoplasty, which results in the immediate recovery of the blood supply, as, compared with ADF, it enlarges the spinal canal. Our classification system is based mainly on clinical neurological symptoms, which are sometimes inconsistent and might be affected by the mental or general health of the patient . To counter this, we used performance tests, the MMT, and the quantitative sensory score to evaluate neurological deterioration as objectively and quantitatively as possible. However, still two patients (0.6% of this study) could not be classified into any of five types, because they showed hemilateral lower extremity dysfunction with bilateral or contralateral upper extremity dysfunction. These patients surely showed myelopathy signs but might be affected by other locomotorium diseases such as lumbar spinal canal stenosis, knee arthrosis, or so on. In addition, we noticed that most patients with posterior lesion syndrome demonstrated obvious ataxic gaits, but some did not exhibit significantly lower scores in the TST, the GRT, or the sensory test. We needed to diagnose these patients using other examinations, such as the Mann test, stabilometry, and imaging techniques. Needless to say, recent innovations in diagnostic imaging have facilitated the accurate diagnosis of cervical myelopathy. We also incorporated imaging findings from MRI and CT myelograms to confirm the precision of the classification in this study; however, such techniques often produce falsepositives . Further advancement in diagnostic techniques, including diffusion tensor imaging [19,20], positron emission tomography , and other methods, are widely expected to improve the accuracy of our classification system for cervical myelopathy. In addition to neurological technologies, the further development of electrophysiological diagnostic techniques will be necessary in the future . We proposed a novel classification system for cervical myelopathy, which was mainly based on assessments of neurological symptoms derived from objective and quantitative examination tools. We successfully divided all but two of our patients into five types and described the characteristics of each type. Types I and II, which mainly involve segmental signs of the upper extremities, showed greater postoperative neurological improvements than Types III and V, which can involve damage to the posterior column or the entire cross-sectional area of the spinal cord. Crandall PH, Batzdorf U (1966) Cervical spondylotic myelopathy. J Neurosurg 25: 57-66. Gerard CS, O’Toole JE (2014) Current techniques in the management of cervical myelopathy and radiculopathy. Neurosurgery Clinics of North America 25: 261-270. Yarbrough CK, Murphy RKJ, Ray WZ, Stewart TJ (2012) The natural history and clinical presentation of cervical spondylotic myelopathy. Advances in Orthopedics 2012: 1-4. Hattori S (1975) Pathophysiology and classification of cervical spondylotic myelopathy, Rinsyo Seikeigeka (Clinical Orthopaedic Surgery) 10: 990-998. Ono K, Ebara S, Fuji T, Yonenobu K, Fujiwara K, et al. (1987) Myelopathy hand –new clinical signs of cervical cord damage. JBJS Br 69: 215-219. Mihara H, Kondo S, Murata A, Ishida K, Niimura T, et al. (2010) A new performance test for cervical myelopathy: The triangle step test. Spine (Phila Pa 1976) 35: 32-35. Hosono N, Sakaura H, Mukai Y, Yoshikawa H (2008) A simple performance test for quantifying the severity of cervical myelopathy, JBJS Br 90: 1210-1213. Singh A, Crockard HA (1999) Quantitative assessment of cervical spondylotic myelopathy by a simple walking test. Lancet 354: 370-373. Japanese Orthopaedic Association (2000) Japanese Orthopaedic Association scoring system for evaluation of cervical compression myelopathy. J Jpn Orthop Assoc 68: 490-497. 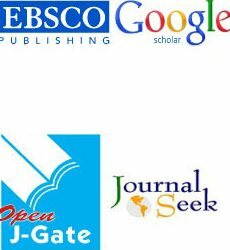 Hirabayashi K, Miyakawa J, Satomi K, Maruyama T, Wakano K (1981) Operative results and postoperative progression of ossification among patients with ossification of cervical posterior longitudinal ligament. Spine (Phila Pa 1976) 6: 354-364. Brain WR, Northfield D, Wilkinson M (1952) The neurological manifestations of cervical spondylosis. Brain 75: 187-225. Nurick S (1972) The pathogenesis of the spinal cord disorder associated with cervical spondylosis. Brain 95: 87-100. Ranawat C, O’Leary P, Pellici P, Tsairis P, Marchisello P, et al. (1979) Cervical fusion in rheumatoid arthritis. JBJS Am 61A: 1003-1010. Vitzthum HE, Dalitz K (2007) Analysis of five specific scores for cervical spondylogenic myelopathy. Eur Spine J 16: 2096-2103. Breig A, Turnbull I, Hassler O (1966) Effects of mechanical stresses on the spinal cord in cervical spondylosis. A study on fresh cadaver material. J Neurosurg 25: 45-56. Chakravorty BG (1969) Arterial supply of the cervical spinal cord and its relation to the cervical myelopathy in spondylosis. Ann R Coll Surg Engl 45: 232-251. Daltroy LH, Phillips CB, Eaton HM, Liang MH (1995) Objectively measuring physical ability in elderly persons: The physical capacity evaluation. Am J of Public Health 85: 558-560. Boden SD, McCowin PR, Davis DO, Dina TS, Mark AS, et al. (1990) Abnormal magnetic-resonance scans of the cervical spine in asymptomatic subjects. A prospective investigation. JBJS Am 72: 1178-1184. Demir A, Ries M, Moonen CT, Vital JM, Dehais J, et al. (2003) Diffusion-weighted MR imaging with apparent diffusion coefficient and apparent diffusion tensor maps in cervical spondylotic myelopathy. Radiology 229: 37-43. Maki S, Koda M, Saito J, Takahashi S, Inada T, et al. (2016) Tract-specific diffusion tensor imaging reveals laterality of neurological symptoms in patients with cervical compression myelopathy. World Neurosurgery 96: 184-190. Di Chiro G, Oldfield E, Bairamian D, Patronas NJ, Brooks RA, et al. (1983) Metabolic imaging of the brain and spinal cord: studies with positron emission tomography using 18F-2-deoxyglucose in normal and pathological cases. J Comput Assist Tomogr 7: 937-945. Sato T, Adachi Y, Tomori M, Sakaki K, Ishii S, et al. (2009) Functional source imaging of human spinal cord electrical activity from its evoked magnetic field. IEEE Transaction on Biomedical Engineering 56: 2452-2460.